"World of Thieves" becomes "A Thief Melody"
It's been a while since the last post... I must post more often! Yes! This will be the new official logo/title of the game. I spent quite sometime thinking whether I should change the name or not... And finally I thought that "World of Thieves" might not be very well suited for a game where you don't see that many thieves. Plus, I wanted something that conveyed the idea of music, because I like it, and moreover because it will be a part of the gameplay, and maybe of the story too. I wanted an efficient and simple visual, and I hope this one is clear enough. And as you might get it from the picture, yes, the hero will be able to play the flute. 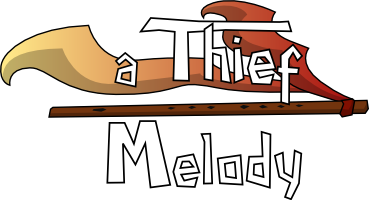 Or you can use the "A Thief Melody" menu on the header. (Don't worry you can still get to the dev blog from this new homepage). Basically, there are dowload links to get the latest demo (which is always the same by the way), social network links and a few screenshots and info about the game. I also plan to add a trailer, but I still have to create it, so this will be for later. Until now, the Dev Blog was the homepage, and the somehow chaotic and numerous information might have got most of the visitors confused about the game, especially if their are not into tech stuff. So, I hope this page is clear enough to get a good overview of the game. Tell me what you think about it! If you watched the above web page, you might have noticed new icons for social networks if you want to get the latest news: Twitter and Google +. I'm not sure if I'll be able to post everything on all the communities, but I'll give it a try, see how many people respond to it/are interested, and see what I can handle. The thing is, old school RSS and mail subscriptions are not that many (but a big thanks to you guys, who were the first followers! ), and I reach more people through sites like Facebook or IndieDB, which are easier for people to follow. And of course, these accounts are new, so there is not much to read at the moment, but I will repost at least every blog article and new demos on these sites. OK so this was a post mostly centered on communication and marketing stuff, but don't worry, I still work on the tech and artistic side and the game is slowy improving. 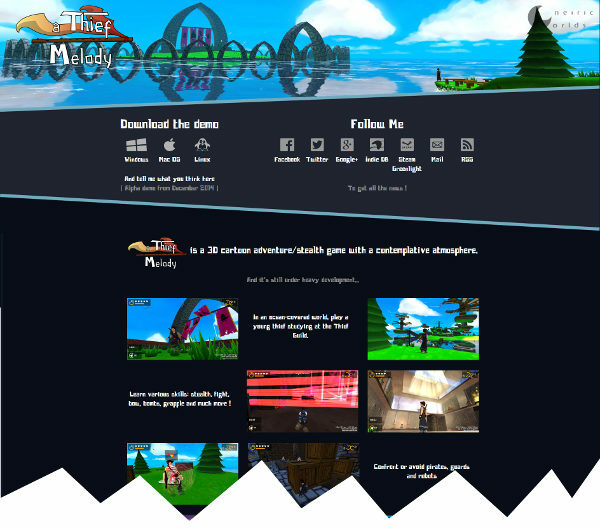 Check out the last screenshots on the new homepage! More on that on another post! Peace, and thanks for your support.